Louisiana's constitution allows for less than unanimous jury verdicts in most felony cases. Louisiana is one of only two states – Oregon is the other – that allows people charged with felonies to be convicted when only 10 of 12 jurors agree on guilt. Attorney Ben Cohen with the Promise of Justice Initiative poses for a photo in a legal library in New Orleans, La., Wednesday, March 28, 2018. Cohen works to reform Louisiana's criminal justice system. Allen stood accused in the killing of Dicarie James on a back road south of Houma. The two men had quarreled over a drug deal inside James’ car. As he lay dying, James told deputies it was Allen who shot him three times with a .22-caliber revolver, twice in the chest. Allen initially professed innocence, but he later admitted killing James, saying he fired in self-defense. The jury deliberated for 2½ hours until it reached a decision: guilty as charged of second-degree murder. But as with many verdicts in felony trials across Louisiana, this one came with serious misgivings — and a pronounced racial divide. The two black jurors disagreed with the rest. It didn’t matter. In Louisiana, unlike anywhere else in America, that was good enough to send Allen off to a mandatory life prison term, with no chance of parole. That was too much for juror Willie Newton, 71, who builds cemetery vaults. Newton and Bobby Howard, a soft-spoken man who runs an accounting firm in Houma, both said they felt manslaughter, with its maximum 40-year sentence and no minimum, was the fairer verdict. “Maybe my life experience is a little different than some of the white people,” Howard, 62, said in explaining his dissent. Both men said they were bothered their voices were silenced by the vote — and both believe Louisiana should require unanimity. The unique law that allowed a Louisiana jury to send Allen to prison for life without the consent of all 12 jurors did not happen by accident. The newspaper’s analysis found that 40 percent of trial convictions, like that of Matthew Allen, came over the objections of one or two holdouts. When the defendant was black, the proportion went up to 43 percent, versus 33 percent for white defendants. In three-quarters of the 993 cases in the newspaper's database, the defendant was black. Had Matthew Allen killed Dicarie James in any state but Louisiana, his murder trial could not have ended the way it did — with a conviction opposed by two jurors. Tilting the scales: In Louisiana, is it truly a 'jury of one's peers' when race matters? The right of a defendant to be judged by “a jury of one’s peers” is a bedrock concept in American justice, dating to ancient English common law. “I wasn’t there yet in my mind, that he should be found guilty,” said Robin Edgens, who was a “no” vote in the East Baton Rouge Parish cold-case murder trial of Symond Taylor in 2016, before deliberations wrapped up with a conviction after less than 90 minutes. The Advocate’s database of 993 cases shows that — contrary to what logic might dictate — unanimous verdicts tend to arrive more quickly. 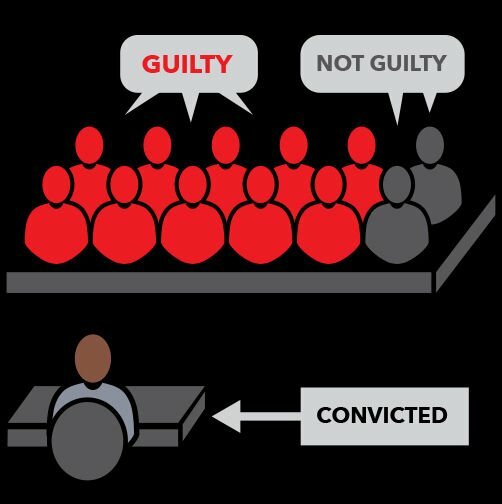 When a jury is sure of guilt, unanimity often comes easily. In many split verdicts — unlike the case Edgens described — it’s a struggle to get to 10 votes. The median deliberation time for unanimous verdicts in these 993 cases was 77 minutes, compared with 121 minutes for split decisions. Edgens said the other holdout was a young woman who, like Taylor, is black. She seemed ready to dig in. Lorenzo Neff was more certain of his position as one of two holdouts in the 2013 manslaughter trial of Leroy Woods, who stood accused in East Baton Rouge Parish of clubbing a man to death with a gin bottle. While split verdicts in any trial are illegal in 48 states, they are routine in Louisiana. On average, the state sends one person to prison every five days on the word of a divided jury. About half of them face sentences so stiff they likely will die in prison. But trials tell only part of the story about the effect of Louisiana’s 10-2 verdict scheme in a justice system dominated by plea deals, with only a small share of all felony prosecutions ever making it to a jury. Thousands more Louisiana defendants take deals minimizing their prison time rather than risk the often massive consequences of a guilty verdict. In shifting away from unanimous juries 120 years ago, Louisiana loosened a cornerstone of Anglo-American legal tradition: the notion of guilt “beyond a reasonable doubt.” If one-sixth of a jury thinks a defendant is innocent, some critics wonder, how can the threshold for a conviction possibly have been met? Supporters of split verdicts say Louisiana needs its unique justice system because it’s more efficient. The notion of unanimous juries is so woven into the fabric of American courts that even jurors who show up for service in Louisiana often do not know that the state allows split verdicts. Melissa Dottley said she had braced for rising tensions in a jury room inside the East Baton Rouge Parish courthouse as the holdouts moved one by one toward convicting Marvin Varnado in a 2013 kidnapping trial. Dottley and another juror remained “no” votes when the deliberations ended. Before a black defendant even gets their day in court, the odds already have started to pile up against them. How dramatically depends on the jurisdiction. But The Advocate’s analysis of jury selection shows that for most trials, a much smaller share of black people shows up in the pools of people who respond to jury summonses than in the populace as a whole. In East Baton Rouge Parish, the difference between the proportion of voting-eligible black people and their percentage in the “venires” of prospective jurors called to the court exceeded 10 percentage points. That’s a gap the U.S. Supreme Court defined as unacceptable in a 1979 decision. In that case, involving Missouri, the court said it didn’t matter whether the falloff was purposeful or not. Would-be black jurors face a second round of cuts inside the courtroom. In a typical Louisiana trial, lawyers sift through 25 to 50 people before settling on a panel of 12. Prospective jurors field basic questions meant to weigh their fitness. Lawyers for either side may ask the judge to remove any juror for “cause” based on biases or relationships they reveal, a request the judge can grant or reject. Next, both sides may use “peremptory” challenges to eliminate up to 12 jurors apiece without giving any reason. The court minutes from the February 2013 trial of Jarrell Arline on a charge of dealing cocaine are so cursory they border on cryptic. So even when a black defendant draws a venire well stocked with black people, the panel that’s selected often fails to reflect that diversity. Take Shawn Myron Stevenson, who was tried in Terrebonne Parish in December 2013. He had been booked on cocaine-dealing charges after he bolted from a car pulled over by State Police, who said they saw him ditch a bag as he ran. The bag held about a quarter-pound of cocaine, police said, and Stevenson had about $5,000 in cash in his pocket. Stevenson maintained his innocence, saying there were multiple people in the car and that the drugs weren’t his. In the courtroom that morning was a remarkably diverse group of 35 prospective jurors — 10 of them black — in a parish where only one in six adults is black. Prosecutors urged Judge Randall Bethancourt to excuse one black woman because she appeared to be sweating. The judge declined but let her go after she said her relationship to the defendant's girlfriend could affect her ability to be impartial. Prosecutors used peremptory strikes to get rid of four other black jurors and persuaded Bethancourt to remove two other black people for cause. Two more black prospective jurors were excused by the judge, one because of a felony record and another because she knew some of the defendant's relatives. In the end, not one of the 10 black people made it onto the panel. One black man was assigned the role of alternate, or backup, juror. Two days later, a half-hour after beginning deliberations, the jury foreman sent a note to Bethancourt inquiring about an eye-popping fact on a police report presented during the trial. “We, the jury seen that he was arrested ten times before. What was his prior arrests?” the note read. Four minutes later, the jury found Stevenson guilty on both counts. Now 41, he is four years into a 15-year stint at the Iberia Parish prison. The data gathered by The Advocate show that — if not always as flagrantly as in the Stevenson case — prosecutors go hard to remove black jurors. But defense attorneys do the same thing in reverse, trying every bit as hard to remove white jurors. In Louisiana’s most diverse parishes, these racially selective strikes tend to cancel out each other. But in parishes with a smaller share of black residents, prosecutors are often able to make juries much whiter than they otherwise would be. In Ascension Parish, the 31 juries examined by the newspaper were on average 19 percent less black than the venires from which they were drawn. In Terrebonne Parish, the dilution was even more stark — particularly when the defendant was black. In the 22 Terrebonne cases with black defendants examined by the newspaper, the proportion of black people fell by 33 percent from venire panel to actual jury. When the defendant was white, the drop was only 8 percent. Joseph Waitz, Terrebonne Parish’s district attorney since 1994, defended his office’s practices and said he trains young prosecutors to seek a fair jury, nothing more. “There’s no coaching that says we strike minorities,” Waitz said. “Each attorney does it as they see fit, and they try and get a fair and impartial jury. The U.S. Supreme Court’s 1986 ruling in Batson v. Kentucky was meant to solidify the meaning of “a jury of one’s peers.” That decision didn’t guarantee a right to a jury that is representative of the community. Rather, it said there can be no systematic effort to exclude certain people or groups. Ever since, when lawyers for either side lodge a “Batson challenge,” the lawyer seeking to strike a juror must offer race- or gender-neutral reasons for the judge to review. But the reasons don’t always have to be sound — leading many scholars to complain that the ruling achieved little. Critics of Batson included Justice Thurgood Marshall, the Supreme Court’s first black member. Though he was part of the 7-2 majority in the case, Marshall fretted that Batson’s protections would prove “illusory.” Nimble lawyers could easily devise innocuous rationales for their actions, Marshall reasoned. Many lawyers acknowledge privately that they rely partly on stereotypes — especially race — in picking juries, in part because prospective jurors are often tight-lipped. In Shawn Stevenson’s case in Terrebonne Parish, there was an obvious racial pattern to the strikes. The defense ultimately got rid of 11 white prospective jurors, while the prosecution eliminated seven black prospective jurors, along with a Native American and a Caucasian — the only strikes that fell outside the pattern. The prosecution lodged three Batson challenges and the defense two, but the judge rejected them all. "Y'all are pretty hand in hand" in terms of racial striking, said Bethancourt, the judge. "So what's good for the goose is good for the gander." Many critics of the Batson decision say the ruling wrongly focused on the rights of the jurors rather than those of the defendant. Countless pages of legal journals are filled with their arguments. The Batson ruling’s shortcomings are magnified in Louisiana, where a jury can simply ignore two of its members, nullifying their votes — and that problem has been little-studied. Though the Louisiana Supreme Court has upheld the 10-2 scheme itself, it grappled in 1989 with one troubling consequence of the law: that it can help prosecutors cloak a racial motivation behind juror strikes. Calvin Collier had challenged his armed robbery conviction, complaining that East Baton Rouge Parish prosecutors blatantly targeted black prospective jurors. The District Attorney’s Office had used eight of its peremptory challenges. All eight targeted black people. That left two black people on the jury, and Collier was convicted on a 10-2 vote. It was his second trial. The first ended in a mistrial when the jury — which included three black people and nine white people — could not agree on a verdict. In a 4-3 decision, the state’s high court awarded Collier a new trial because prosecutors’ supposedly “nonracial” reasons for two strikes withered under scrutiny. The court scoffed at their contention that they struck two black jurors because of their Baptist affiliation, when they had approved four other Baptists for the jury — two black and two white. Prosecutors opted not to try Collier a third time, instead offering him a deal: He could cop a plea on a charge of simple robbery and accept a six-year sentence. Collier said he took the deal to get out of jail. He already had served enough time by then that he was released one year later. Had he been convicted of armed robbery, he would have been required to serve at least 10 years, and as many as 99. The Advocate data show that the calculus the court highlighted in Collier is often in play. In close to half of Louisiana’s 64 parishes, a perfectly representative jury would wind up with two or fewer black members — in some cases without interference — and in others that would be achieved with only a slight dilution of black people from the jury pool. Terrebonne and Ascension parishes neatly illustrate this phenomenon. An “average” jury would have 2.7 black members in Ascension Parish, and 2.1 in Terrebonne. But in reality, the “average” jury in Ascension has 1.7 black members; in Terrebonne, the number is 1.3. If jurors in these parishes were picked at random from the adult population, about half of all Ascension juries would have at least three black members — a threshold that would ensure their relevance to the verdict. In reality, less than one in five juries meets that mark. In Terrebonne, meanwhile, the disparity is even more pronounced. One-third of Terrebonne juries filled at random would have at least three black members. In reality, only one in 16 reaches that threshold. Despite its concerns over abuses of the split-verdict scheme, the state’s highest court has consistently refused to tamper with the system itself, even when confronted with its dubious origins at the 1898 constitutional convention. And most of the attempts to rid Louisiana of the law have focused on those ignominious origins. But so far, that argument hasn’t carried the day with any judges, largely because the rationale for the law and its mechanics changed more than four decades ago. In 1972, a deeply divided U.S. Supreme Court validated nonunanimous verdicts in state courts — but not federal ones — when it ruled on a pair of cases from Louisiana and Oregon. The next year, Louisiana lawmakers opted to change the rule at a new constitutional convention. In a compromise, the number of jurors required for a verdict was raised from nine to 10. And there was no lingering stench of white supremacy permeating this debate. Backers insisted split verdicts saved jurors’ time and avoided costly retrials caused by hung juries. The law’s sordid history, little known at the time, didn't come up. State voters ratified the new constitution, which contained numerous other important changes, by a 58-42 percent margin. Jurists and prosecutors, regardless of their sympathies, have since argued that the change effectively cleansed the majority-verdict law of any racist intent. Former 4th Circuit Court of Appeal Judge Paul Bonin, who is white, used those grounds to shoot down an appeal filed by the notorious New Orleans gangster Telly Hankton that challenged the 10-2 law’s constitutionality. The appeal argued that the law’s racist genesis was a permanent stain on it. Bonin agreed that the law began with racist intent but denied the appeal. Now an Orleans Parish Criminal District Court judge, Bonin said he thinks defense attorneys must move on to the present. Another New Orleans judge drew a similar conclusion after entertaining a rare evidentiary hearing on the question last year. Legal scholars and historians testified about the law’s racist origins and its effect on defendants and jurors, while offering a litany of cases where people convicted on 10-2 or 11-1 votes were later cleared. Judge Arthur Hunter, a black former police officer who took the bench in 1996, found those arguments unpersuasive. “The court needs direct evidence and exacting science," Hunter wrote in denying the challenge. "To show disparate impact, the court needs to see a full-scale study which looks at the numbers to provide conclusive demographic data which necessarily shows disproportionate impact." Some scholars who have written extensively on the topic say The Advocate’s research provides the evidence that Bonin, Hunter and others requested. Ben Cohen, a New Orleans-based attorney who has filed more than 20 petitions asking the U.S. Supreme Court to reconsider the Louisiana law, said the data support a constitutional argument that the high court thus far has declined to take up. And although the state’s district attorneys association is on record opposing efforts to change the law, the district attorneys are not in complete solidarity. Warren Montgomery, district attorney for conservative St. Tammany Parish, told The Advocate last summer that he was tired of being put on the defensive over the 1898-born rule. Presented with the newspaper’s analysis in February, Montgomery said he was ready to support a change, assuming the findings are not challenged. This is one part of an occasional series examining Louisiana's nonunanimous jury law. Click here to see the entire series. Needing only 10 of 12 jurors to agree, Louisiana is one of only two states in which juries can convict by nonunanimous decisions (Oregon being the only other state).